Following the footsteps of rival HBO, Showtime now offers a standalone service with no pay-TV subscription required. Here's what you need to know. HBO is no longer the only premium pay-TV channel to venture outside the bundle. It now has competition from Showtime, which also lets you subscribe without tying you to an expensive package from a third-party service provider. Showtime’s streaming service costs $11 per month and is available on Apple devices and Roku media streamers. 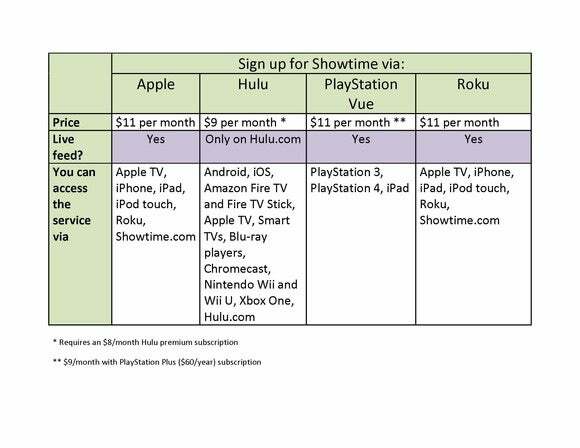 PlayStation users can also get Showtime through Sony’s PlayStation Vue TV service, and subscribers to Hulu’s $8-per-month streaming-video service can add Showtime for an extra $9 per month. 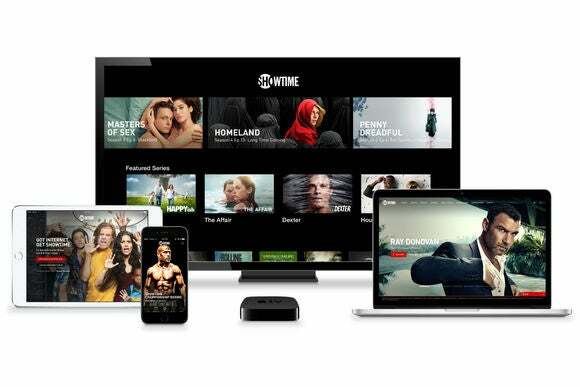 Showtime’s streaming service offers live feeds of both the east- and west-coast channels (no matter where you live), along with a substantial back catalog of on-demand video. That includes original series such as Homeland and Dexter, movies, comedy specials, sports programming, documentaries, and “after hours” material. Showtime says there are no blackouts of any kind, and all on-demand programming should appear at the same time that it airs on TV. Instead of handling sign-ups and billing directly, Showtime is passing those duties on to Apple and Roku. That means you need an Apple TV, iPhone, iPod Touch, iPad, or Roku media streamer to sign up for Showtime’s standalone service. (We’ll get to the Hulu and PlayStation versions shortly.) Likewise, if you want to cancel the service, you must do so through either Roku or Apple, depending on which provider you signed up with. Once you have a standalone Showtime subscription, you can watch on any device where the Showtime app is available. For now, that includes Apple devices, Roku players, and Showtime.com on any laptop or desktop computer. If you have a PlayStation 3 or PlayStation 4, you can get Showtime through Sony’s PlayStation Vue app (with no need for Vue’s expensive channel bundles). And if you subscribe to Sony’s $60-per-year PlayStation Plus gaming service, the price of Showtime drops to $9 per month. Subscribing through the PlayStation, however, does not grant access to Showtime’s Apple apps, Roku channel, or website. Aside from PlayStation consoles, the only other way to watch is through the PlayStation Vue iPad app. Aside from being cheaper than Showtime’s standalone service, Hulu’s main advantage is app support, with availability on Android, iOS, Apple TV, Xbox One, Nintendo's Wii and Wii U, Roku, PlayStation 3, PlayStation 4, Amazon's Fire TV and Fire TV Stick, Chromecast, certain smart TVs (LG, Samsung, and Vizio), certain Blu-ray players (LG, Samsung, and Sony), and Hulu.com. There’s just one catch: To watch Showtime’s channel in real time, you must use Hulu.com on a desktop browser, as none of Hulu’s native apps support live video. Showtime already offers a streaming service called Showtime Anytime, but it’s only meant for people who get the channel through a traditional pay-TV provider. (It does, however, work just fine if you can mooch a login from a legitimate subscriber.) 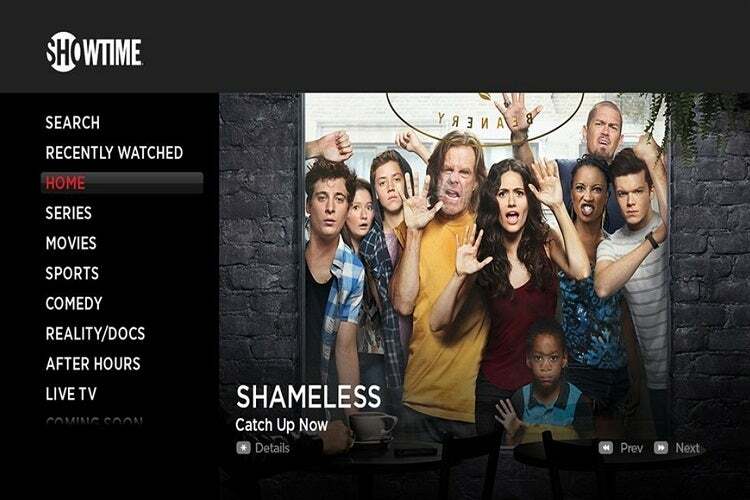 The standalone and cable-based apps are nearly identical in terms of content and design, though Showtime Anytime is available on more platforms. While HBO’s policies on account sharing are murky, Showtime has clear limits: Subscribers can activate up to five devices at a time, and they can stream from up to three devices at once. (Showtime’s website lets you manage your device activations if you go over the limit.) In other words, it’s enough to share with family members and maybe a close friend, and that’s about it.